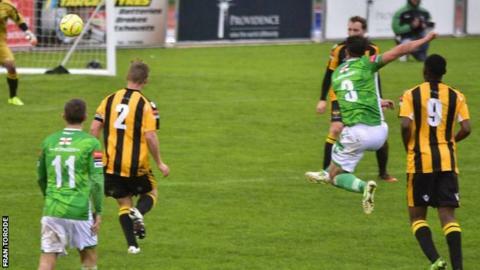 Guernsey FC boss Tony Vance says he is impressed with the form of full-back Jacques Isabelle. The 28-year-old scored for the first time this season as he fired in a long-range effort in the 3-1 win over East Grinstead Town at Footes Lane. "It's great to see him have a run in the team and be consistent," Vance told BBC Radio Guernsey. "The more consistent players we can have, certainly in the defensive positions, the better it is for us." And Isabelle's goal, his first since a 4-3 win at Whitstable Town in December 2014, was the highlight of the match. "It was a good strike - he does hit a clean ball and he gave us some emphasis going forward down that left side," said Vance. "He gives us a good attacking threat, so it was one of those that as soon as it left his boot it was always going in."